Dotti's "Oriental Garden" was the People's Choice winner in Bower Center's recent Botanical II exhibit that closed May 2. The last weekend of the exhibit several floral designers created arrangements for some of the art work. 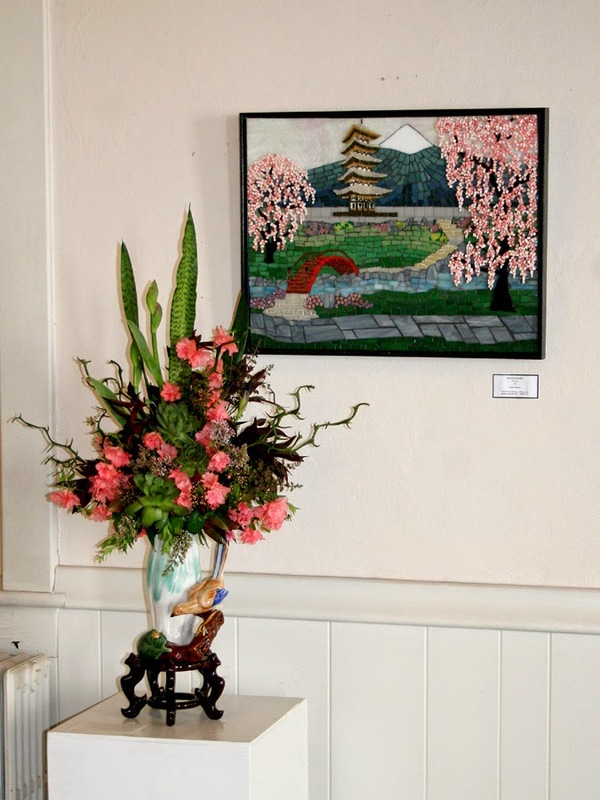 Karen Craig made a beautiful one to complement "Oriental Garden." Lynchburg's Academy of Fines Arts Annual National Juried Exhibition opens Friday, April 4, 5pm-8 with a gallery talk at 5:30. My "In the Looking Glass" has been juried into this exhibit. Come to a wonderful venue for fine art at 600 Main St in downtown Lynchburg on First Friday in April. And don't forget to visit the other galleries that evening while making your way around town. 207 E Depot Street in Bedford VA.
Gallery hours are Wednesday through Saturday, 11am-4pm. 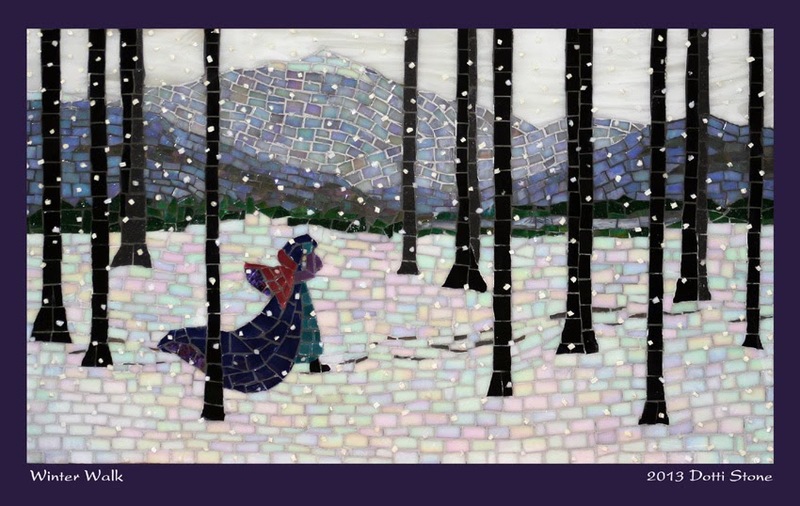 to see new art work, including that created for the holiday season. Tuesday, October 1 Dotti and Stephen will be installing Mosaics: Classical Meets Contemporary, an exhibit of mosaics showing Stephen Brailo's works made using traditional techniques and materials, marble and smalti, and have the look and feel of mosaics created hundreds, even thousands of years ago - very classical. 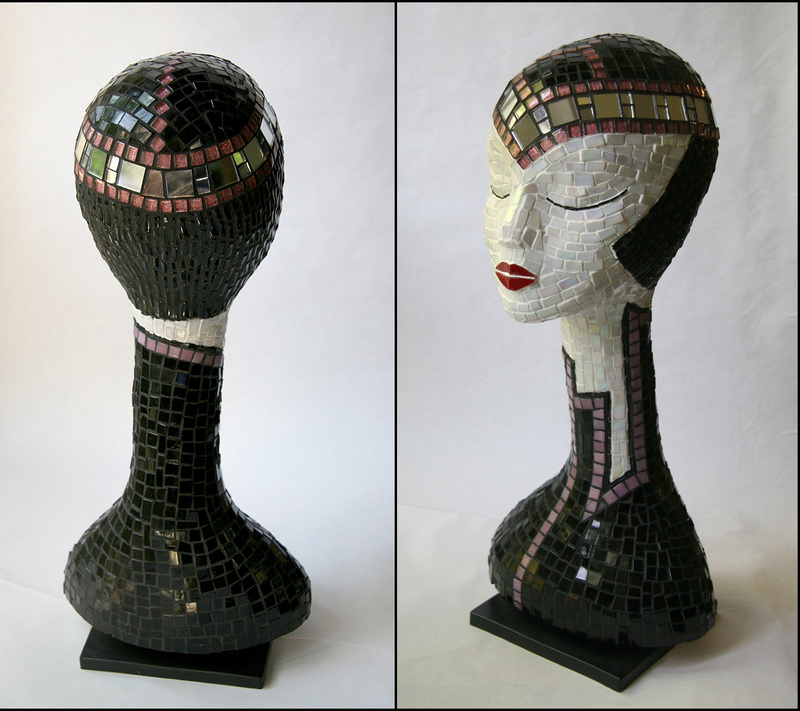 Dotti Stone's work is made using various techniques, 2-D and sculptural, and incorporates a combination of materials: various types of glass tiles, smalti and unglazed porcelain. talk with visitors about the materials and tools used before placing them in the showcase. Time approximate - should be about noon to 1. 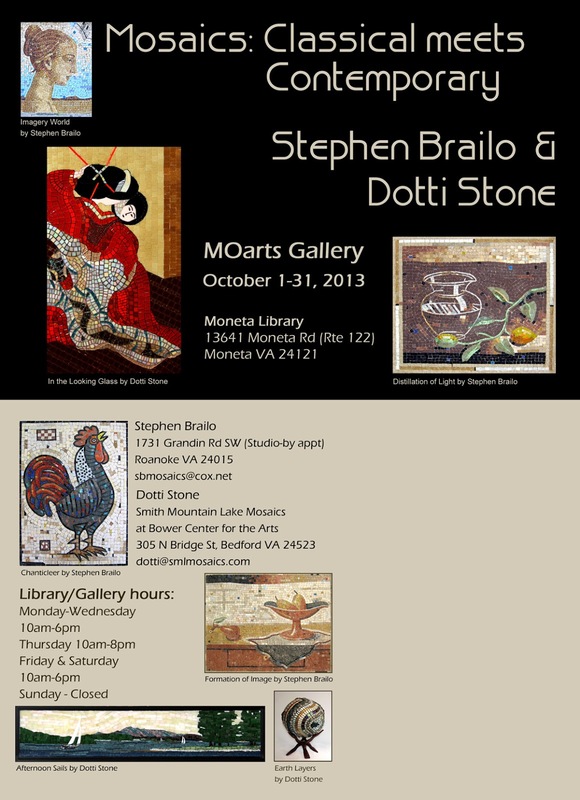 During the month of October Stephen Brailo is joining Dotti in a mosaics exhibit at MOarts Gallery at the Moneta Library (off 122 near downtown Moneta) in Moneta VA.
Mosaics artist Stephen Brailo was born in Croatia where he received his art education at the Academy of Fine Arts. In 1964 he immigrated to France, where he participated in numerous art shows throughout Europe. 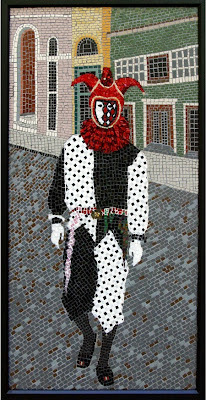 Currently he resides and works in Roanoke, Virginia. 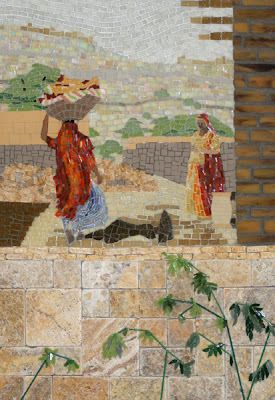 Stone mosaics and their beautiful natural colors last forever. 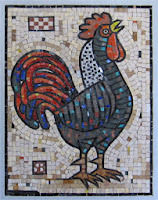 From the ancient Greeks through the Roman Empire and the Byzantine period, brilliant mosaics tell the story of life. Brailo is a mosaics artist who uses the same ancient methods to create mosaics today. 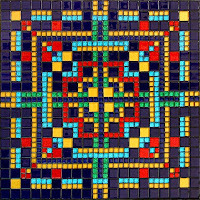 Dotti Stone received her formal art education at Richmond Professional Institute (now VCU) in Richmond VA. After years in the Washington DC area as a professional photographer and owner/designer of Great Falls Stained Glass she studied mosaics with Gene Sterud whose concentration is reproducing ancient mosaics. In 2007 Dotti relocated to the Smith Mountain Lake area and in 2010 settled in Bedford, Virginia. During that time she concentrated on exploring different materials - glass, stone, porcelain and ceramic and, in addition to flat panels experimented with sculptural mosaics. Since 2009 she has maintained a studio at Bower Center for the Arts where she teaches classes. 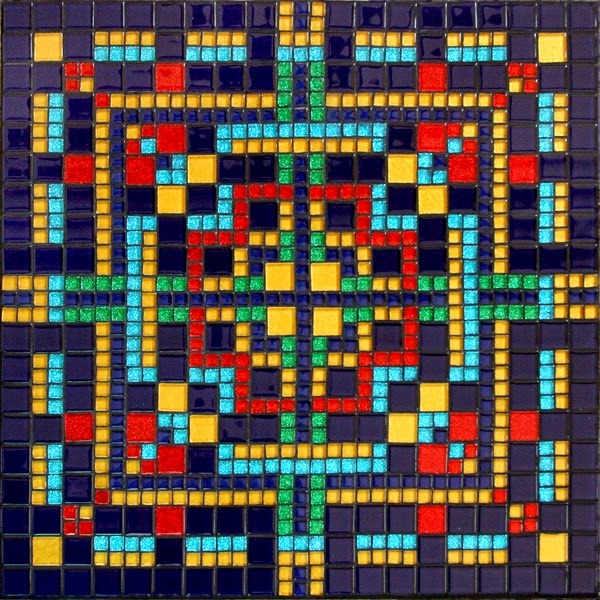 She is a member of The League of Roanoke Artists, The Electric Company Artists' Co-op in Bedford and exhibits extensively. 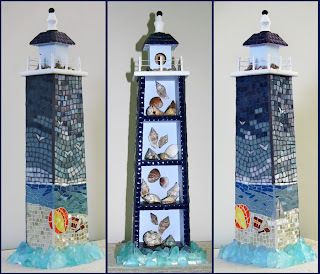 Interested in making a mosaic sculptural mosaic ... either as a slightly 3-D work that can hung as a 2-D art work or a self-standing sculpture? Lynchburg artist Bonnie Kinnaird is joining me with this class. Her experience working in concrete will be as asset for teaching the creation of armatures for making figures and animals. 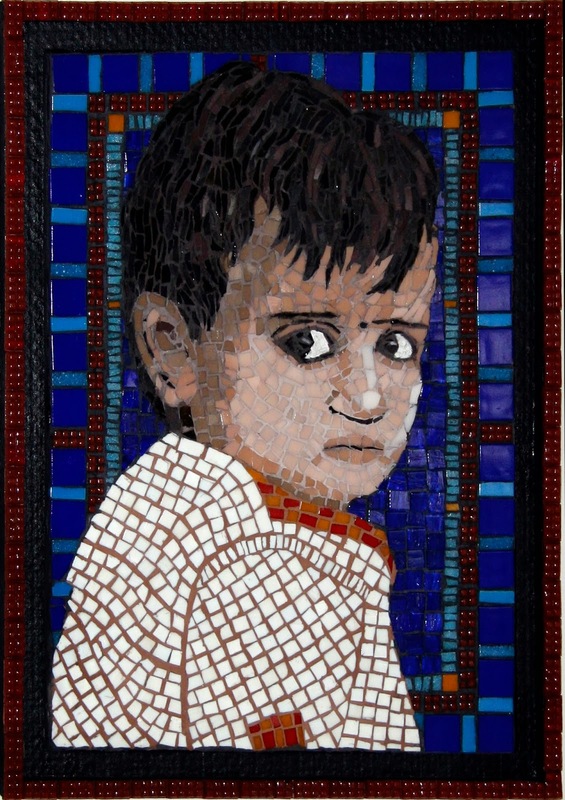 Students will work on a simple shape to mosaic each session of this 7-week class. 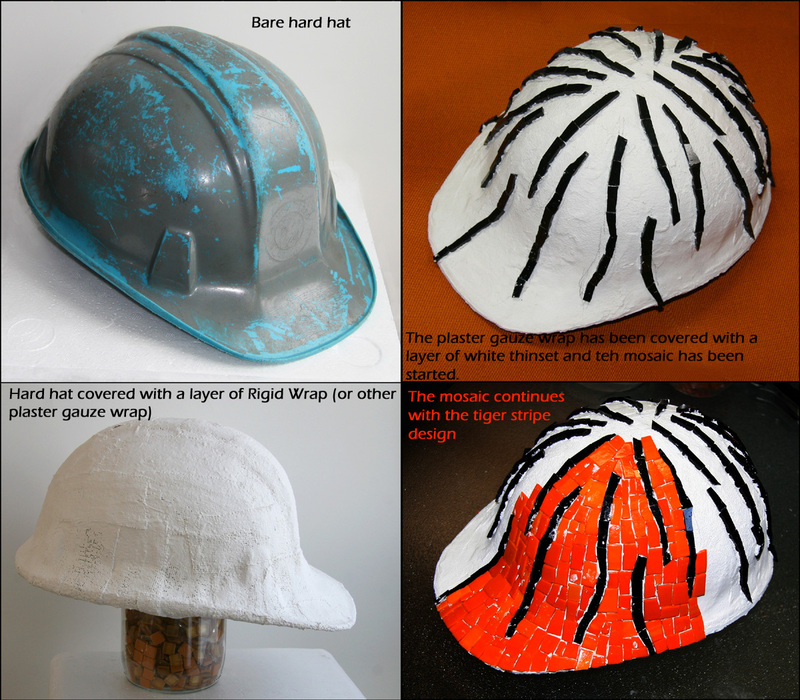 During each session students will take part in demos to create substrates and armatures for different shapes to make a variety of forms and learn to prep ready made forms. What type shapes? They may include: pillows, spheres, ceramic animals, concrete garden critters, free form shapes, mannequins, cones, figures-human or animal. "Earth Layers" in a 9 diameter gazing ball. 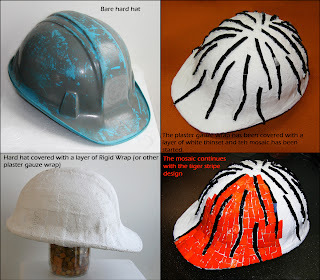 A friend gave me the hard hat and asked if there was anything I could do with it. After a long time it may be ready to return soon ... covered with a design inspired by a story. 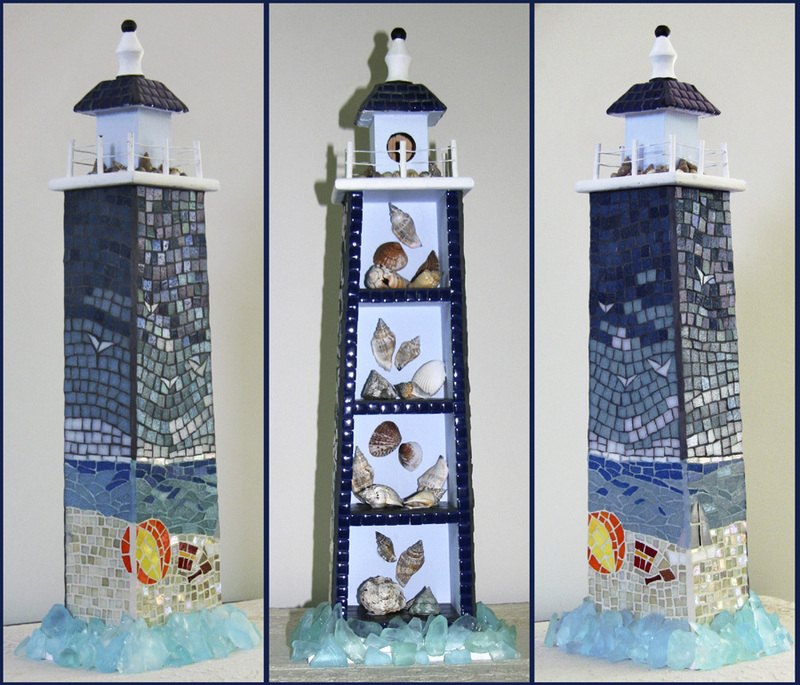 The lighthouse mosaic is on a wood structure from a local craft store. 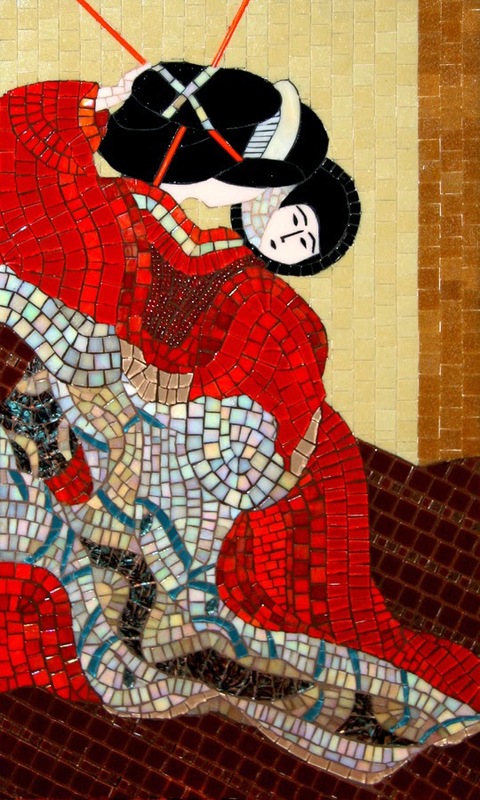 While wood is not the best substrate for mosaics, if the wood is sealed and the mosaic is kept indoors and away from moisture that will help to avoid problems with warping. 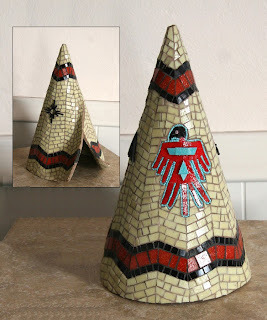 "Thunderbird Tepee" was made using hardware cloth to make the basic shape as it was for "Remnant: Reversible Blue" to the left. This shape is affixed to Hardi backer board and wired for hanging. 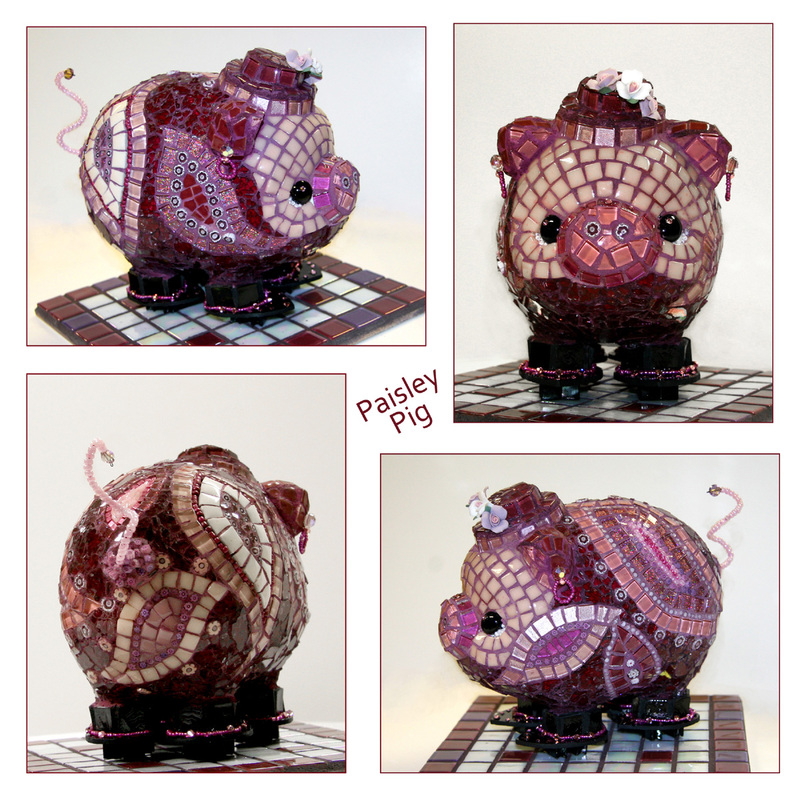 "Paisley Pig" ... this little cutey is (was!) a piggy bank that has been mosaiced. 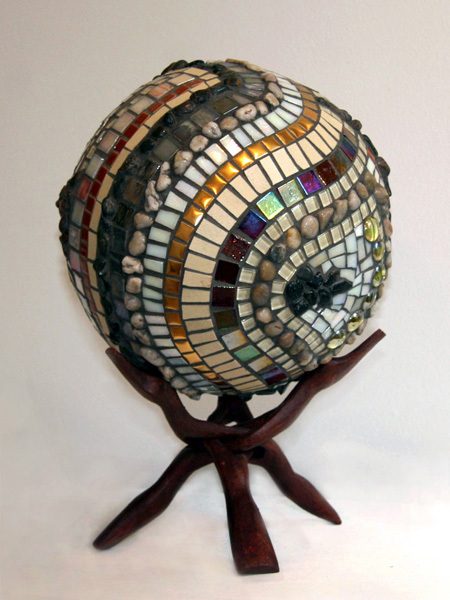 It was made for Bower Center's fundraising gala in 2012. Fellow Bower Center resident artist Karen Carter provided the piggy bank. 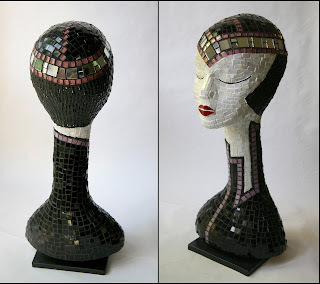 Lots of glitzy tiles cover this fancy lady! The registration information should be on Bower's website very soon. Come join this fun class. There are several dates skipped - this will give students additional time for any projects they may wish to work on at home or at Bower Center between sessions. 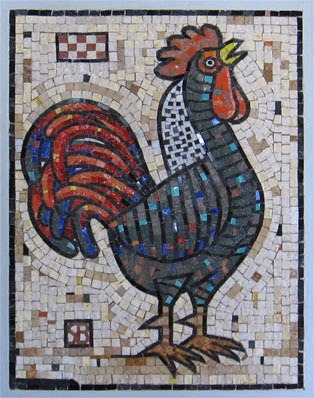 I create 2-D and 3-D mosaics, exhibit, and teach youth and adult classes at Bower Center for the Arts, 305 N Bridge St, Bedford VA 24523. 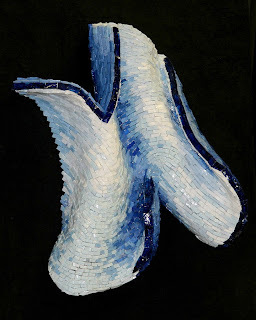 My work may be seen regularly at TECAC, The Electric Company Artists' Co-op, 207 E Depot St, Bedford VA, in my studio and, beginning, July 12, The Cornerstone Gallery at Bower Center.